The places time forgotFrom the magical empty theatres of Detroit to the lost playgrounds of Chernobyl, there are places across the globe that were once a hub of activity, but are now abandoned and in decay. With nature creeping in and reclaiming these spots, we are left with eerie crumbling ruins and breathtaking views that offer us a window into the past and capture our imagination. 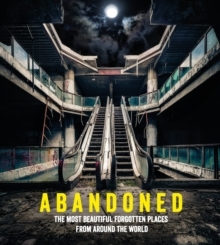 Abandoned showcases the very best photographs from around the world documenting this phenomenon. More immersive than a museum and more human that a lecture, abandoned photography has given the world an exciting way to look at our history and the places we have long neglected. Compiled and curated by photographer and former urban explorer, Mathew Growcoot.